Anyone who has ever lived in one of Chicago’s neighborhoods knows that winter isn’t over until around May. With snow clinging to the ground it is hard to imagine warmer months are ahead, and with them comes moving season. In our opinion, Summer is the time of year when the city really comes alive. But we think now is the best time for people preparing to move to Chicago to ask the questions “what are the best places to visit in Chicago” and “where are some of the cheap places to live near Chicago?” We here at Move Matcher wanted to share where Chicago young professionals are moving in the city this year. Using moving data from individuals aged 21-35 over the past year, we’ve compiled our list of Chicago’s best neighborhoods for Millennials in 2019 to give you a head start on making the most of summertime in the city. If you’re a recent college grad, there may be no better place to live than Lakeview. If you live in Lakeview, you’re just minutes from excitement. 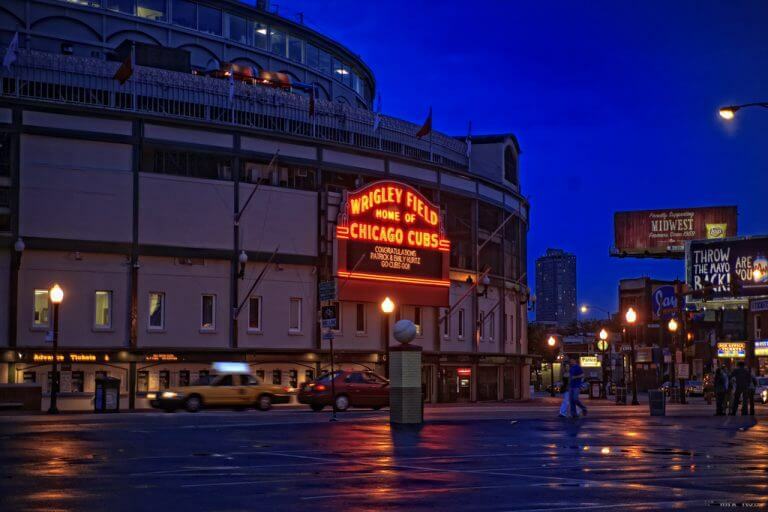 Lakeview includes the area surrounding Wrigley Field, known as Wrigleyville, and contains dozens of sports-themed bars and restaurants. You can even try your luck in the batting cages at the very popular Slugger’s World Class Sports Bar. Even if you’re not a baseball fan, the area around Wrigley Field has tons of non-sports themed bars and restaurants such as GMAN Tavern near the Metro. Lakeview is also home to Boystown, one of the largest LGBT centric neighborhoods in the country. Here you’ll be able to find all kinds of bars and nightlife, and tons of comedy clubs including The ComedySportz Theatre, Laugh Factory, and Annoyance Theatre. 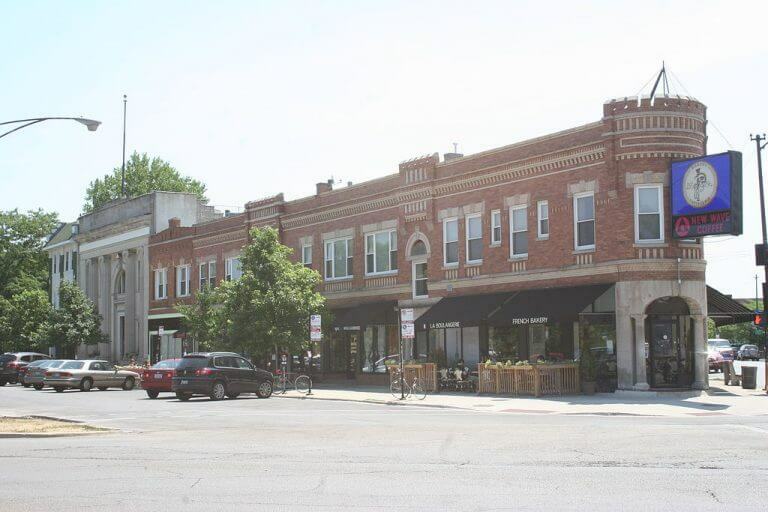 While Wrigleyville and Boystown are more hectic, the western part of Lakeview maintains a quieter setting. Lincoln Park is known as one of the nicest and priciest community areas in Chicago with the median price of homes at $517,500, and average rent running at about $3,500 a month. Located on the north side, Lincoln Park is home to both young professionals and families. One of the biggest advantages of living in Lincoln Park is all the green space available in the neighborhood’s namesake park. 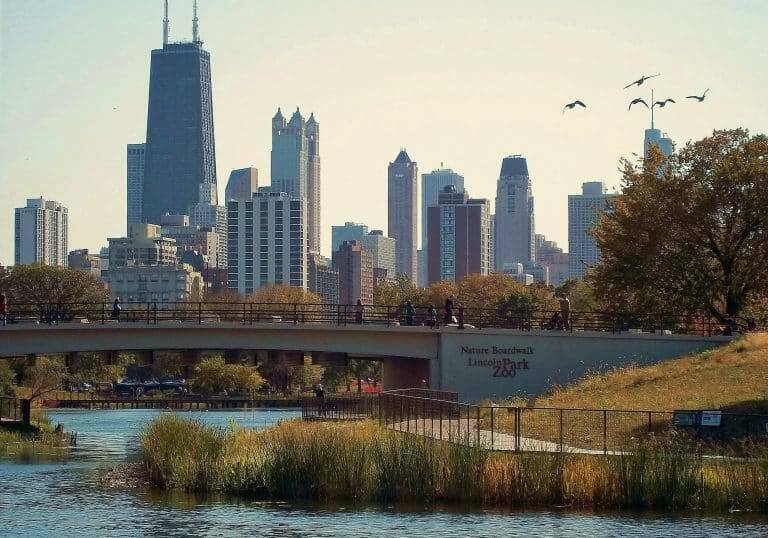 Stretching along miles of lakefront, Lincoln Park is the city’s largest public park. Not only does the park host the Lincoln Park Zoo (admission is free! ), there are plenty of places to walk your dog or throw the football or frisbee around Lincoln Park’s 1208 acres. Additionally, Lincoln Park is home to many bars that make for a great nightlife scene including, The Red Lion Pub which serves up lovely British pub vibes and according to Yelp reviewers a killer Scotch Egg. Old Town has seen an incredible amount of growth over the past year. While the rent can be pricey with the median house price at $337,500, and rents starting at $1250 for a one-bedroom apartment, it can be worth it for the great food and entertainment options. The Happy Camper is always full of friendly hipsters looking to have a great time in the neon-clad bar, and 1959 Kitchen and Bar offers fantastic American fare. Old Town is also home to the Second City improv group. Famous Second City alumni include John Belushi, Dan Aykroyd, and Tina Fey. 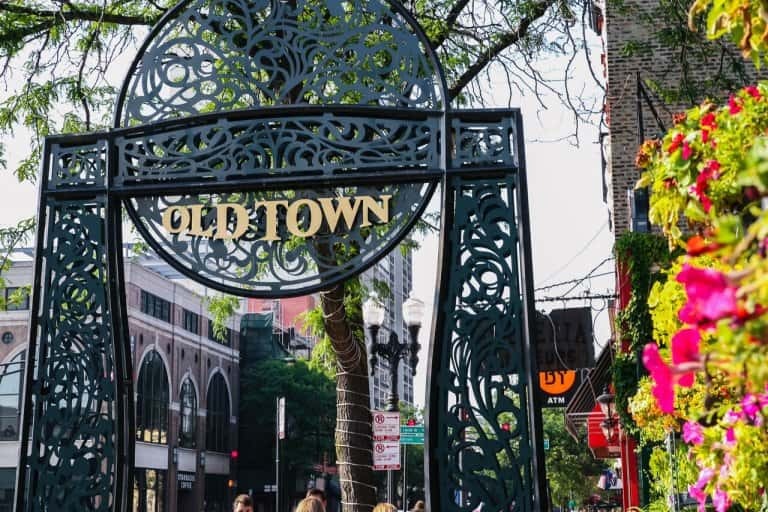 One of the first areas in Chicago to be redeveloped in the 1970s and 80s, Oldtown has boomed with building projects in recent years. 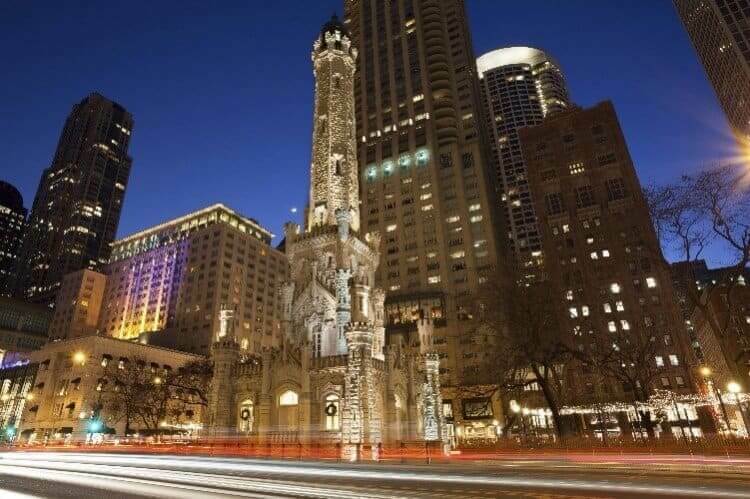 With its proximity to the river, beautiful hotels, and several nightlife options to choose from, River North has become one of the best neighborhoods for young professionals in Chicago. Due to its prime location, River North runs on the pricier side, but its proximity to the Loop and growing restaurant scene including Walton Street Kitchen and Bar, Mason, and Arbella have brought several new high-rises to the area last year. River North is also home to the Merchandise Mart, which used to hold the title for the world’s largest building when it was built. High-end cocktail bars abound in this trendy area. Revel in the atmosphere at the tiki bar inspired Three Dots and a Dash. It’s a good place to meet other millennials for Polynesian inspired drinks on a weekend night. While the rent may be high with studio apartments starting around $1500, the convenience of River North is a major advantage for young professionals. 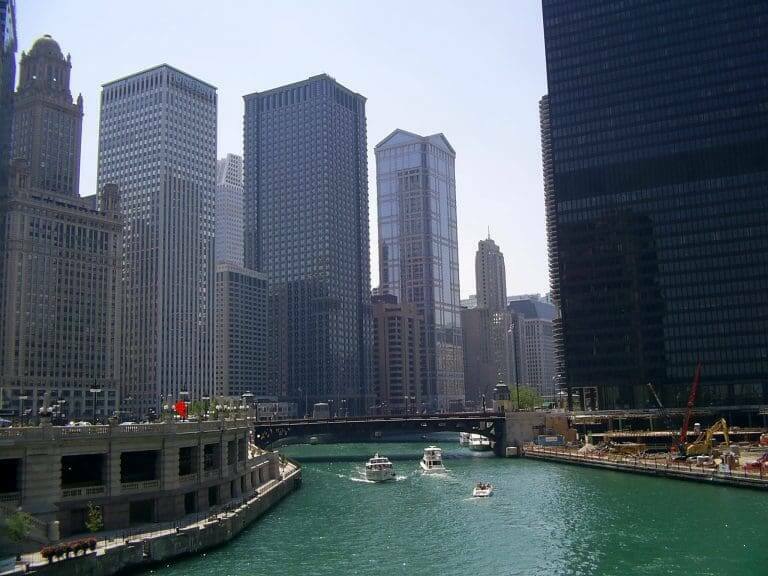 Plus, you can’t beat the views of the city’s iconic skyscrapers seen from the vantage point of the Chicago River. River North’s neighbor Streeterville is next on our Chicago neighborhood guide. Located on some of the most prime real-estate in the city with the river to the south, lake to the east, and Gold coast to the north, it is no wonder that this neighborhood has gotten the nickname of “Platinum Coast”. 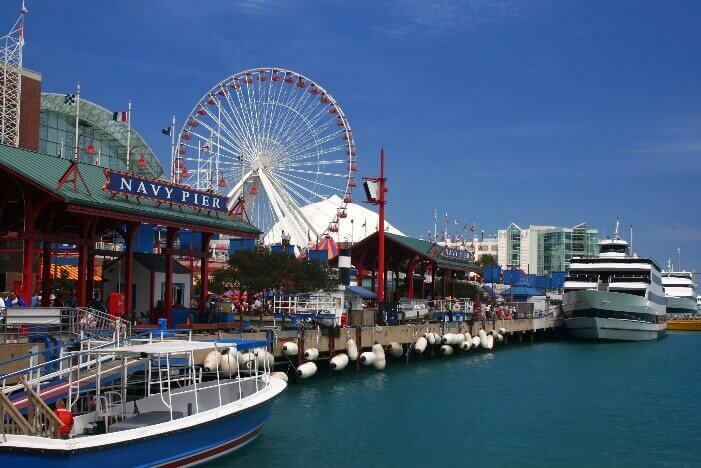 Navy Pier is the biggest draw of this neighborhood, and has garnered a lot of attention with its recent $278 million renovation. Streeterville is home to plenty of great places to get a bite including Francesca’s Chicago, The Albert, and Marisol. This neighborhood is one that tops the list of best neighborhoods to visit in Chicago. OK, time to get it out of our system. Yes, Logan Square is a considered a hipster hot-spot. No that isn’t a bad thing (honestly, what does the term even mean anymore). However, there’s a good reason why so many of the cool kids are hanging out here. With cocktail bars like Spilt Milk, restaurants like Furious Spoon, and the arcade and bar Emporium there are tons of attractions to draw a crowd for a fun night out. Stay a while, and head over to the Logan Theater to watch a film by that obscure Polish director only you and seven other people have heard of. About 15 years ago, Wicker Park was a magnet for artists looking for a cheap place to rent in the city. Since then a lot has changed and the neighborhood is now considered the new Lincoln Park. Wicker Park is a prime destination for anyone looking for one of the city’s prime art and concert hubs. The more cultured crowd also attracts high-quality restaurants to the area. Perhaps the most famous of these is Schwa, which is known for its unconventional style. If an art show followed by a world-class meal sounds like your kind of Friday night, Wicker Park may be the neighborhood for you. Some millennials may prefer a more laid-back vibe, and that’s exactly what they’ll find in Roscoe Village. 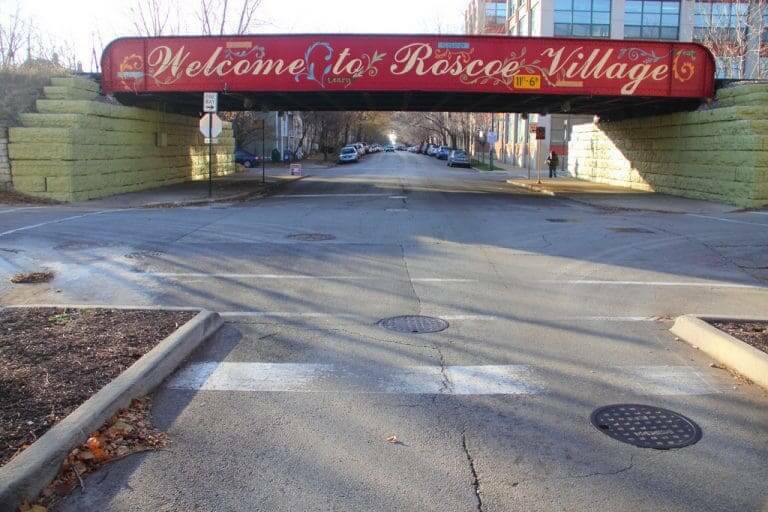 With street after street of tree-lined beauty, Roscoe Village is the premiere spot in Chicago to raise a family. Located in the North Central community area, Roscoe Village has plenty of bars and restaurants, with a slower pace of life than downtown. We know millennials can’t make it through the week without brunch, and there may be no better neighborhood to find a brunch spot than Roscoe Village. If you’re a vegan or vegetarian, Victory’s Banner is a great spot to get your brunch on without worrying about the menu. There are also plenty of bars such as Lush Wine and Spirits, and Kite String Cantina, that offer a more laid-back vibe. East of the Loop, the New East Side, also known as Lakeshore East, is a top spot for young professionals looking to optimize their work-life balance. Residents can walk from their apartment to their job downtown without stepping foot into the icy grip of Chiberia during the winter months. Young professionals, families, and empty-nesters have their eyes set on this neighborhood that boasts close access to Millennium Park, the Art Institute, and Chicago’s beautiful lakefront. Located just south of the Loop, Printer’s Row is the perfect place if you’re an intellectually inclined millennial. 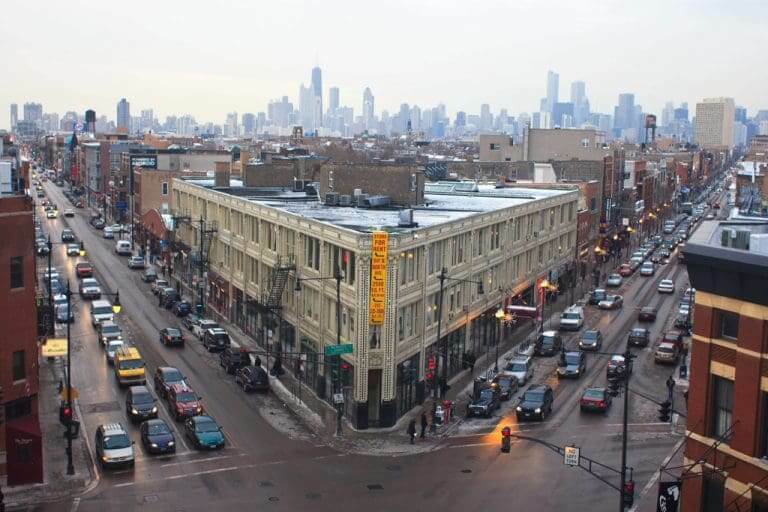 Named for the old printing companies that used to occupy the area, Printer’s Row still lives up to its name. Each June, Printer’s Row hosts an annual literature festival that ignites the mind. Sponsored by the Chicago Tribune, Lit Fest has taken place since 1985 and attracts more than 100 booksellers and 200 authors each year. 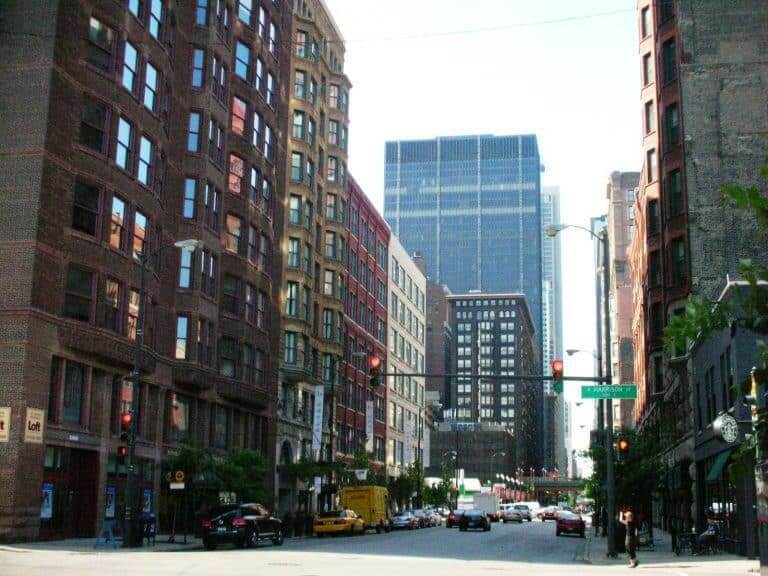 Multiple colleges also have campuses in the neighborhood including Roosevelt University, Columbia College Chicago, Roosevelt University, and DePaul’s Loop campus. Located on the city’s lower west side, Pilsen has always been a welcoming community for immigrants. During its early days in the 1840’s, Pilsen was home to a mostly Eastern European immigrant community. Later in the 1950’s, the neighborhood became home to a vibrant Latino community. Pilsen is home to some of the best Mexican food in the city and an exciting art scene which includes the National Museum of Mexican Art. 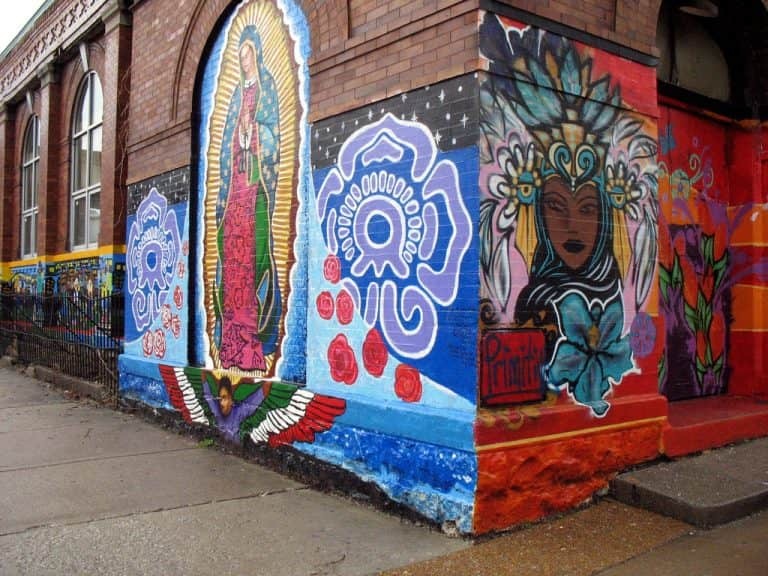 Many buildings in Pilsen are decorated with beautiful and creative murals adding a vibrant feel to the neighborhood. The lower rent prices (about $1500 for a two or three bedroom apartment) have attracted dozens of art studios that open up to the public on the 2nd Friday of every month. If you’re interested in the arts and culture, there may be no better neighborhood than Pilsen for you. On the northwest side of the city and part of West Town lies Ukrainian Village. Clear from the name, Ukrainian Village is a historic neighborhood where Ukrainian and other Eastern European immigrants settled after coming to Chicago. While it still retains its Ukrainian roots, the village has become home to a rising alternative scene. In fact, The Empty Bottle on Western Avenue has become perhaps the best spot in the city to see indie bands. 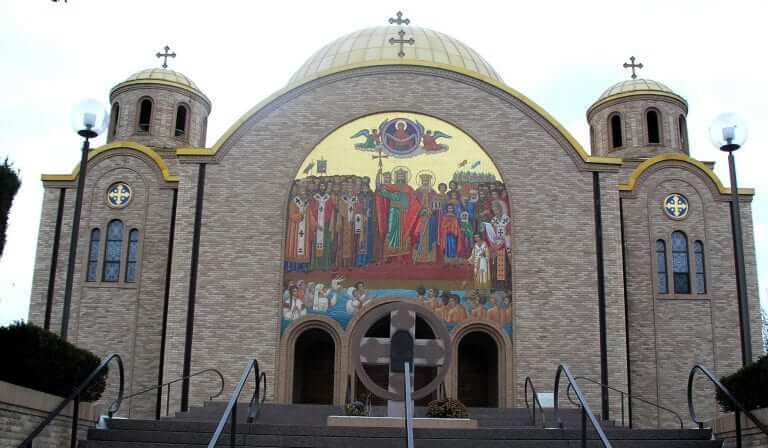 Along with trendy restaurant and bars such as the Sportsman Club, EZ Inn and Leghorn Chicken, the neighborhood maintains some of the most unique and historic churches in the city including St. Nicholas Ukrainian Catholic Cathedral, St. Volodymyr Ukrainian Orthodox Cathedral, and Holy Trinity Orthodox Cathedral. While our list focused on where millennials are moving, we know every one of the 77 neighborhoods in Chicago has something beautiful and unique to offer. If you’re looking for a place to rent in any of these areas, check out Chicago’s own Domu to find an apartment worthy of calling home. Explore even more about the city of broad shoulders and its neighborhoods with our Chicago city guide. If it’s time to lock down the best neighborhood for you, we’ll help you find the best movers to make moving there as easy as possible.